By Antara Dasgupta in Government Documents, PAN Card on December 23, 2018 . PAN (Permanent Account Number) card is a unique 10 – digit alphanumeric code, which is computer – generated and is unique to the holder of the card. This card contains the number and identity details of the individual who applies for the card. Permanent Account Number or popularly known as PAN Card is issued in order to identify various taxpayers in the country. Through this card, all tax related information for a person is recorded against a single PAN number which acts as the primary key for storage of information. This card is a must at the time of filing income tax returns and also for making financial investments. However, PAN card is issued not only to the business enterprises and partnership firms but also to individuals, minors, students, and non – resident Indians as it is a valid proof of identity as well. For that, the Income Tax Department is offering online application for PAN card in the year 2003. The government agencies such as NSDL (National Security Depository Limited) and UTIITSL (UTI Infrastructure Technologies and Services Limited) are providing online service to apply for a new PAN card, correction, and modification etc to the customers. Online Application of PAN card is categorized into two types; one which is made by Indians residing in the country and abroad and the other is foreigners who are running a business in the country. Hence, there are two online processes to apply for PAN card with NSDL and UTIITSL. UTIITSL is another agency which is working on PAN card application, correction etc, authorized by the Income Tax Department. 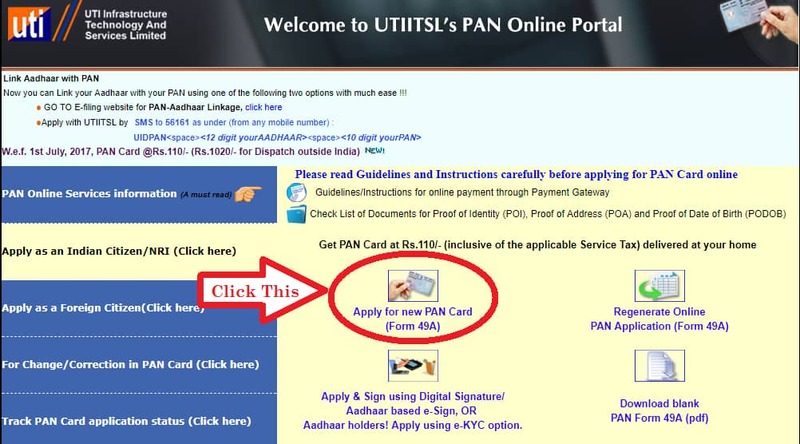 UTIITSL is also offering to apply for a new PAN card by UTIITSL. The process of application is the same as the NSDL online PAN card application process. Procure Form 49 A from the official site of UTIITSL and fill in the form with correct details. 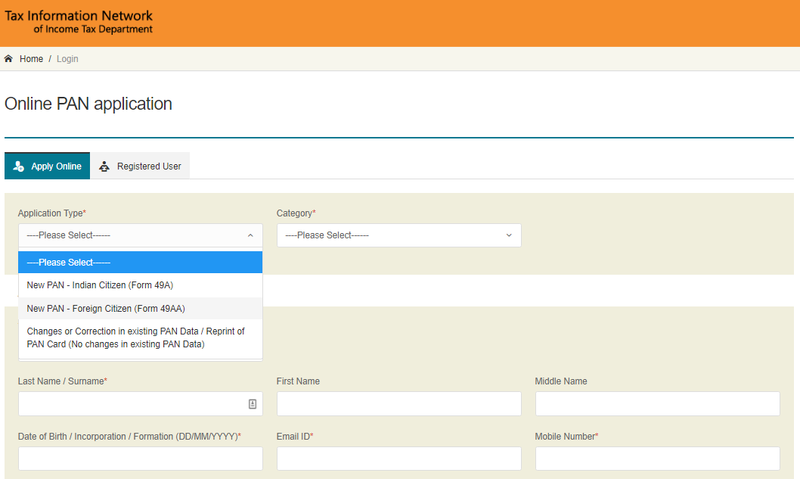 Once you have filled the form with all the required information, click on ‘Validation’ button and submit. In the next step, the applicant is required to make the payments required for a new PAN card and for that you will get two payment options which are Billdesk and PayU. Or if the applicant wants they can pay through Debit card, Credit card or internet banking as well. Once you have made the payments successfully, you will receive a payment confirmation which you can take a print out for future use. For a successful application, once the form is printed by the applicant, attach copies of proof of address, proof of age, and identity proof and send it to your nearest UTIITSL office (UTIITSL PAN offices are located in metropolitan cities namely Mumbai, New Delhi, Kolkata, and Chennai). Once applied you can check the status of your PAN card through the acknowledgment number which you have received at the time of submission of your PAN application form. Note: [In case the applicants have given their thumb impression instead of their signature, it needs to be verified and attested by the Magistrate, Notary or a Gazetted officer]. In case of your original PAN card is stolen or you have misplaced it somewhere, you can get a duplicate PAN card by providing your identity proof and making the required payments. Now the applicants will have to provide a proof that they had an original PAN card. Along with the document send the application form to the office of UTIITSL and once verified, your updated PAN card will be sent to your address. However, in case of any discrepancies, the Income Tax Central Database will then reject your application for a duplicate PAN card. In case your PAN card contains any wrong information, you should get the changes done as soon as possible as this card works as your identity proof as well. The form that needs to be filled is exactly the same and also the documents that need to be attached are all the same. Identity proofs address proof and age proof are the three documents required. Fields that need to be changed are ticked against a checkbox. The updated documents will be sent to the UTIITSL office which is available in the metro cities. A nominal fee is required for the correction or modification purpose. An online application is one of the hassle-free application ways as one can apply for it at their own convenient time and place. Both the agencies such as NSDL and UTIITSL provide easy guides to the applicants so that they can carry forward with the process smoothly. Visit the official website of NSDL and fill up the online form, Form 49 A. Recheck the information you have provided and edit in case of any information that has been filled in correctly. Once you have provided your required details, submit the form. And after the submission, the website will redirect you to a payment gateway for payment of processing fee which is Rs. 110 (Application fees Rs. 93 + 18% Goods and Service Tax). You will get an option for payment i.e. you can pay it via Debit or Credit card or through internet banking. For offline payment method, the fee can be paid via demand draft or cheque. Also note that the applications that have a foreign address, the required fee are Rs. 1020. Once you have paid the required fee, you will receive an acknowledgment number which is generated for the users to keep a reference for future use. And through this reference number, you can then track the status of your PAN card after you have applied for it. Now take a print out of your acknowledgment receipt and send it to the Income Tax Department along with your proof of address, proof of identity and two passports sized photographs. Put all these documents on an envelope and label it as “APPLICATION FOR PAN”. Once the Income Tax Department receives your documents, they will verify the information you have provided. And upon successful verification, a new PAN will be issued to the applicant. And you will receive an email regarding your PAN details. The new PAN card will be sent to the applicant within 30 days of application. For tracking purposes, the acknowledgment number furnished at the time of submission of the application form can be made use of. Note: [Provide the required documents and acknowledgment number within the 15 days of the application; otherwise the applicant may get canceled]. In case you have lost your PAN card or misplaced the document somehow, you can apply for a duplicate PAN card as well. However, the application form remains the same, that is, Form 49A. And the procedure to carry on with the form is same as the above-listed steps for application of new PAN. Keep proof of address, proof of identity and recent photograph handy before applying for a duplicate PAN card. Note: [Also, make sure to keep the ‘Name’ as it is in the documents you are providing. Any discrepancies will lead to cancellation of the application]. In case of any misprint in name or any other error, one should immediately correct it as it also serves as a proof of identity. Also, married women who wish to change their name, they are also required to modify their PAN cards. Correction or modification of PAN card details takes care of exactly these points and offers a chance to cardholders to get their PAN details corrected. The application form to be filled for correction or modification of PAN details has almost the same fields as that for new PAN application.